Today I wanted to share a quick recipe that will be perfect for your Christmas Cookie Tray. I found these Chocolate Chip Cake Batter Cookies on Pinterest a couple months back. The original recipe was pinned by Tried and Tasty and I couldn't wait to give it a try. I did adapt the recipe slightly by using butter in place of oil and adding a bit of vanilla extract. 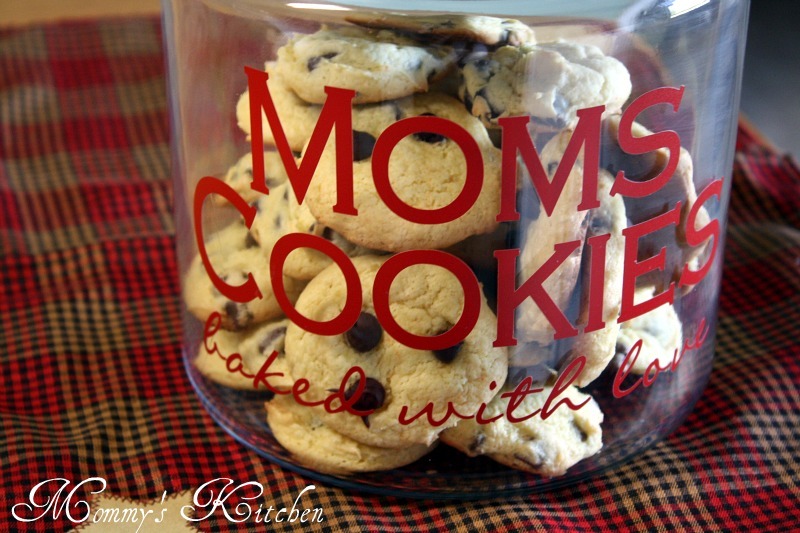 Cookies with a cake mix what a great combination not to mention a huge time saver. I always have a cake mix or two on hand, so these cookies are perfect if you need a quick treat to take to a holiday party. Beware though because these cookies are so addicting! There's no better sight than a full cookie jar, but all those cookies pictured above were gone the very next day. The kids really liked them, so I can't wait to make another batch. By using a cake mix the flavor possibilities can be quite tasty. I think next time I want to try a chocolate cake mix and use a combination of peanut butter and chocolate chips. White cake mix and chocolate chips are a good choice as well. I think the Funfetti cake mix would be great for the holidays and you could toss in some white chocolate chips. Just use your imagination. Preheat oven to 350 degrees. In a medium bowl, stir together the dry cake mix, butter, vanilla, and eggs until smooth and well blended. Mix in the chocolate chips. Drop by spoonfuls onto a un greased baking sheets. Bake for 10 minutes in the preheated oven. Allow cookies to cool on baking sheet for 5 minutes before removing to a cooling rack to cool completely. If not they will fall apart. Cook's Note: I don't think I would substitute applesauce in place of butter or oil because I think this would change the taste of the cookie. Are we supposed to follow the directions on the cake box?? You said you would not substitute applesauce for oil, but your recipe doesn't call for oil. Thanks! I mentioned not substituting applesauce in place of oil because the orginal recipe from Tried & Tasty called for oil. I mentioned in the post that I used butter in place of the oil because I was out. I added it just in case someone wants to go with the orginal recipe and use oil. I LOVE your idea of using a chocolate cake mix with peanut butter chips!! I'm going to try that recipe :) Thanks! You can't beat a good chocolate chip cookie! This sounds so interesting. Just finished making these and they are super yummy. I love it that there so easy to make to. My 4yr old and 20mth old helped me mix them up. Thanks for passing on such a good cookie recipe. Yum! I love things made with a cake mix. It makes things so much easier! My daughter made these tonight and they are just delicious! Thank you for posting this recipe and all the others, they are all so easy and tasty! This is the stuff of pure genius. Both convenient and delicious! For Christmas, I make chocolate cake mix cookies and melt Andes mint chips on top. So yummy! As a big fan of adding vanilla extract... to everything... thank you. This recipe is adapted from Tried and Tasty's recipe. She used oil and I use butter. I did not mention to follow the directions off the boxed mix. I just added the note not to substitute applesauce in place of butter or oil, because it will change the taste. These cookies look amazing! And I love the 'Mom's cookie jar' reminds me of home! Thank you for providing these delicious chocolate recipe with us.